The Horizon Hobby Blade Nano QX quadcopter is ready to fly (RTF) and literally fits in the palm of your hand. It is truly nano (small) but has a high performance as far as a basic drone is concerned. Since it is just a gaming drone without a camera, it can fly indoor with ease – in office or home. It is very lightweight and has protective guards for the blades. 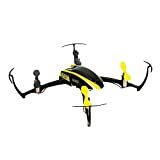 The package includes the QX drone with green and yellow canopies. There are 4 propellers – 2 black and 2 green/yellow, 1 USB charger for LiPo battery, 1 MLP4DSM 4-channel DSMX controller with 4 AA batteries, 1 piece 3.7V 150mAh 25C Li-Po Battery. Nano QX is so easy to handle that you can comfortably fly it in any room. The drone is just for gaming purpose and thus does not have any advanced features or camera. However, the transmitter of the drone has SAFE Technology (Sensor Assisted Flight Envelope) that helps to maneuver easily. There are two modes – Stability mode and Agility mode. The Stability mode keeps the quad in an upright position while flying and the Agility mode enhances the aerobatics like flips, rolls or loops. The LED on the drone is an indicator for many things. In Stability Mode, it is blue. In Agility mode, it is red. When the LiPo battery runs low or when the transmitter cuts power to the motors there is a constant red blinking LED that warns you to bring down the quad safely. Since this is a very small drone – that almost fits into your palm – it is safe to fly indoors. The drone is quite durable and even after hitting the ceiling or other obstacles it remains intact. The propeller guards prevent any damage to the rotors and in case you damage the blades accidentally, there is an extra set provided in the box. The USB charger charges the LiPo within 30-45 minutes. Remember, the LiPo never comes charged in packing and you have to charge it before you start your flying adventure. 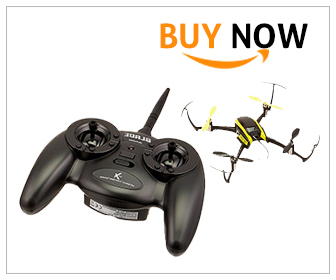 As a drone for beginners, this surely is a good buy all because of its SAFE technology remote. The controller teaches you to control the drone in every aspect – safe regular flight as well as aerial stunts like flips and rolls. The quad has a relatively low fly time of 6-7 minutes. This is due to the very low-efficiency battery. It is advisable to buy extra batteries of 45C instead of the 25C provided by the company. This way, you will need to calibrate the controller only once because every time you change from 25C to 45Cand vice versa, you need to trim again before the thing is functional. Being a very light drone, if you do not control it well, the drone just flies away. Agreed, it has tough plastic body frame, thus, takes a maximum beating and yet comes back to life. However, there are instances where the motor gives away and stops working. This causes the drone to crash. Nano QX may be small size wise, but its performance is commendable and as a basic drone, it does full justice with its sophisticated SAFE controller. Any beginner can master the art of flying by reading the manual carefully and following the directions.